Me and another Lithuanian, we have similar SNPs in our yDNA, and shortly speaking, for me it does mean, that my paternal ancestry might have been derived somehow from Polish-Lithuanian Commonwealth. 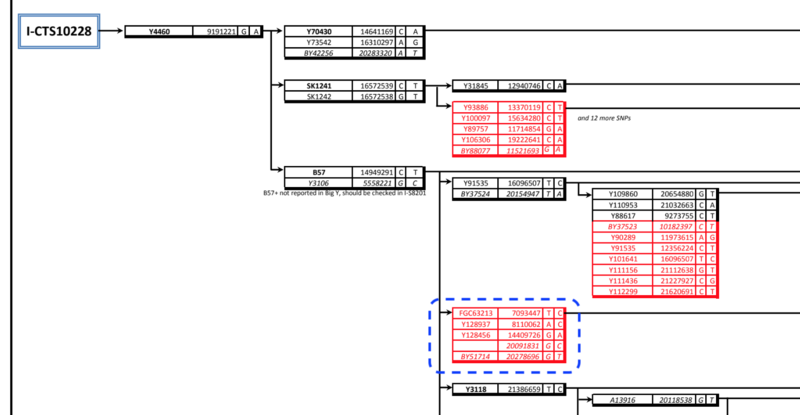 But I need to verify this theory, and I will need deeper SNPs test later. Which means I’m positive for all of them. Note: position 20091831 is about SNP BY182167. 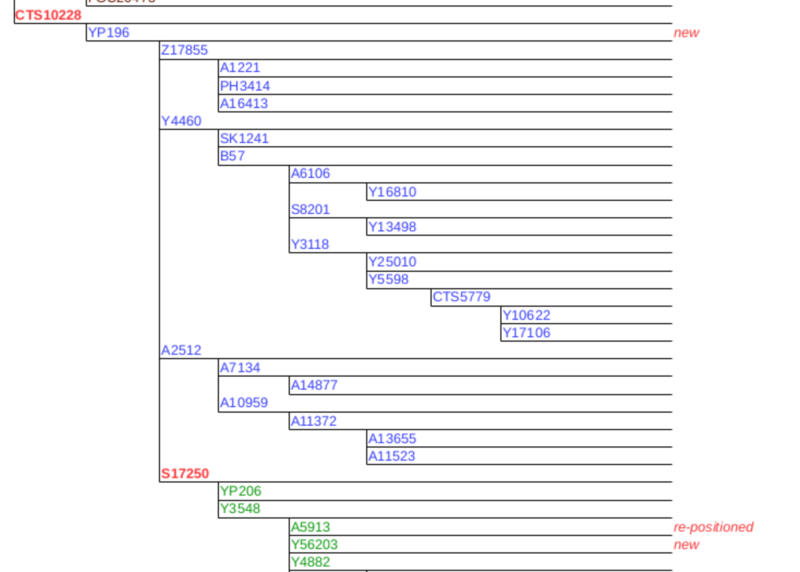 I’m Y128456+, FGC63213+, Y128937+, BY182167+, BY51714+ and Y91535– (and negative for nested SNPs). Note. So far 403541 variants considering for matching (Dec-26-2018. Sep-2018 was 376211). 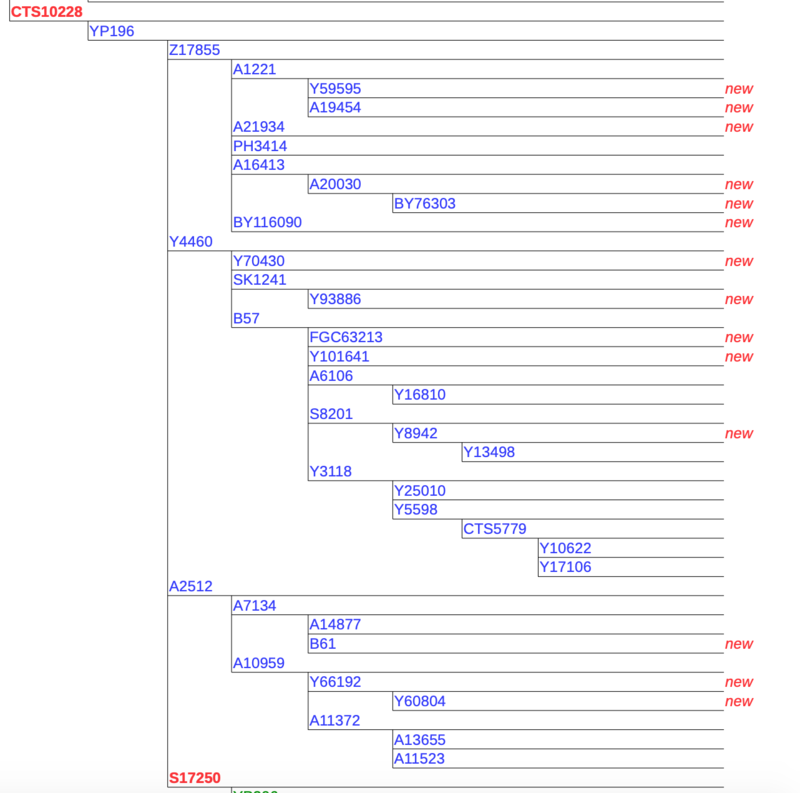 Sep-29-2018, FTDNA released new public yDNA tree. 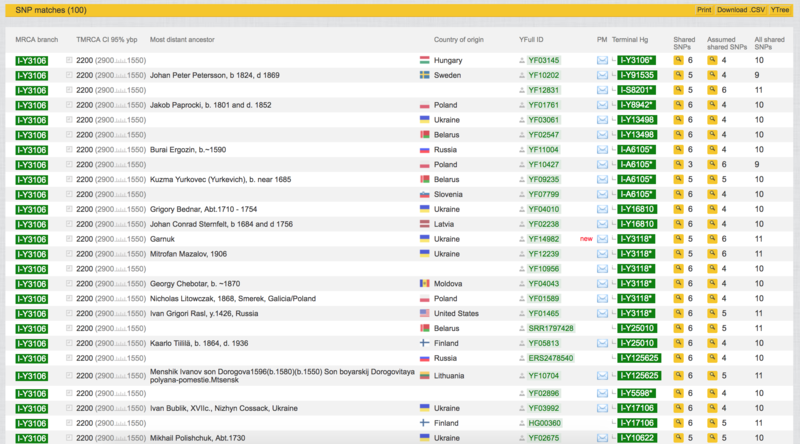 Y70430 is an SNP which assigned to FTDNA account with ancestry (genetics data) from Belarus and Greece. 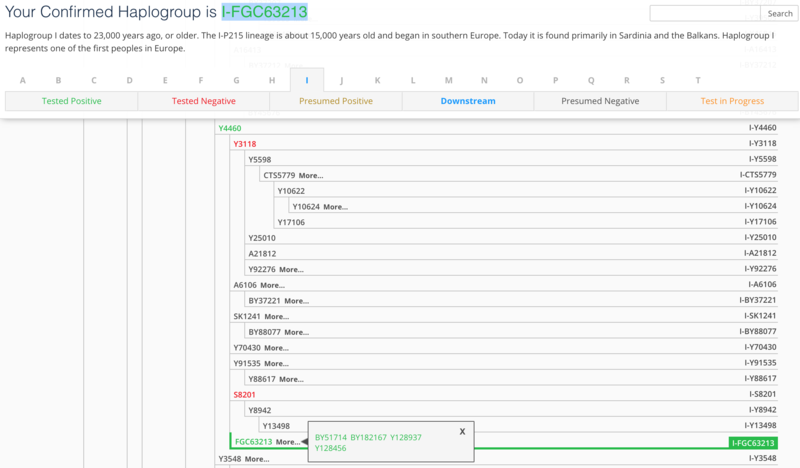 FGC63213 is assigned as terminal SNP for me (Ukrainian) and another Lithuanian person. There is detailed report for every country, and I expect it to be changed all the time. 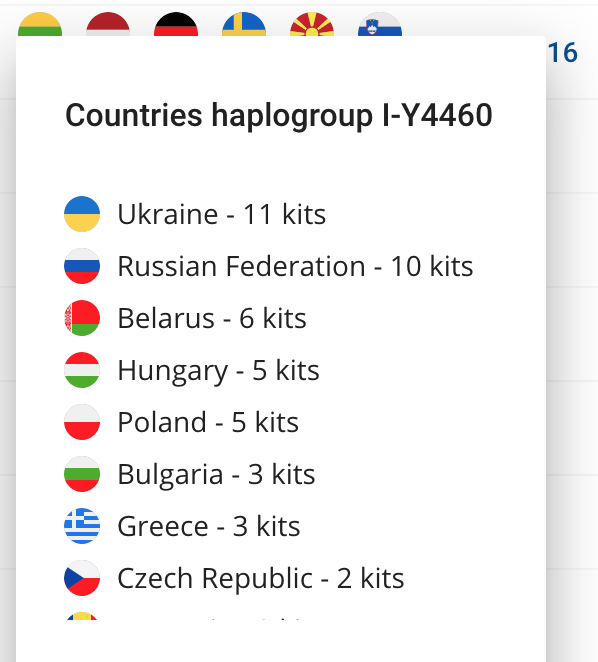 So goal for the 2018 year to forecast – will it be Ukrainian or Russian haplogroup? Despite the fact I may not like it, but very probable it might possible – Russian as majority. I can see other surnames. 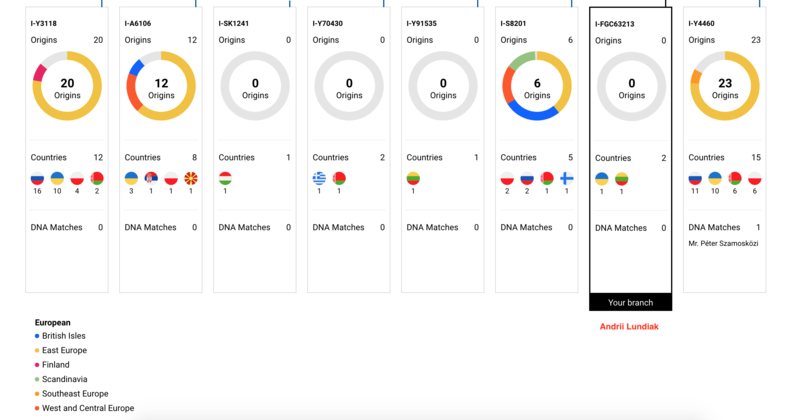 The public Y-DNA haplotree will only display a surname if two or more kits with the same surname that have opted into sharing are both confirmed positive for a Y-DNA SNP. Note: Big Y 500 SNPs info found: FGC63213, Y128456, Y128937, BY51714, BY182167 (by SNP name). 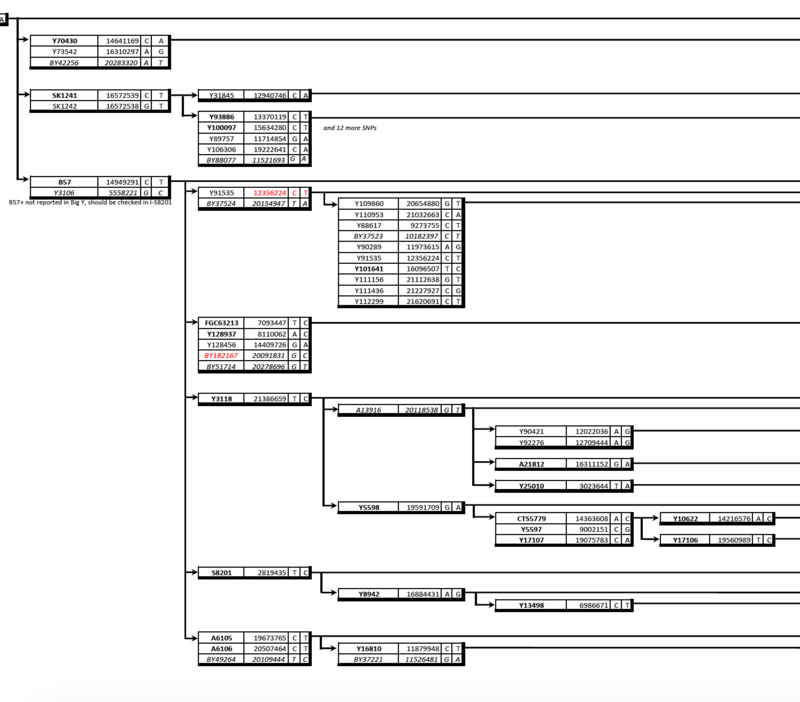 FTDA: “is a block diagram of the Haplotree showing the relationships between you and other Big Y testers. Branch lengths can represent evolutionary time, calculated as number of mutations”. After I got info from FTDNA, I sent small email to YFull support about new discoveries. And next day, information was updated on web page. 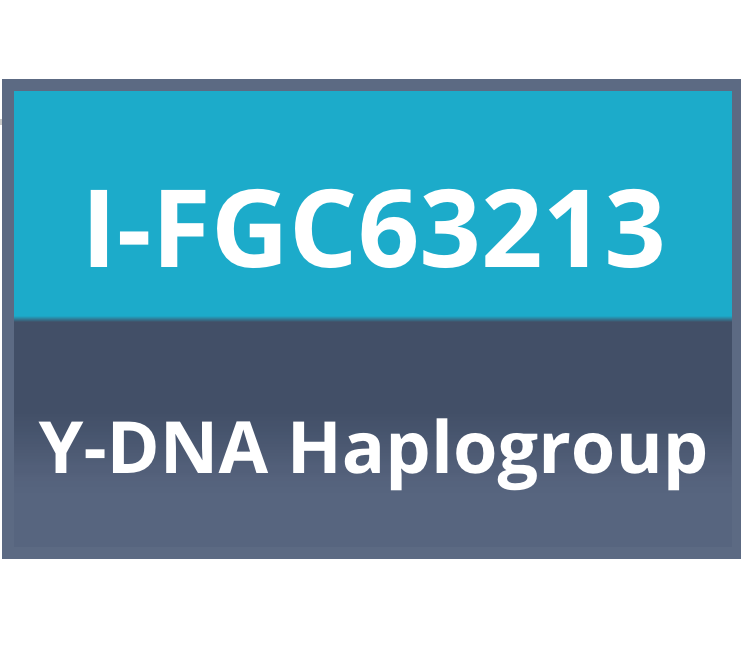 So YFULL assigned I-Y128456 as my Y-Haplogroup, with terminal SNP Y128456. 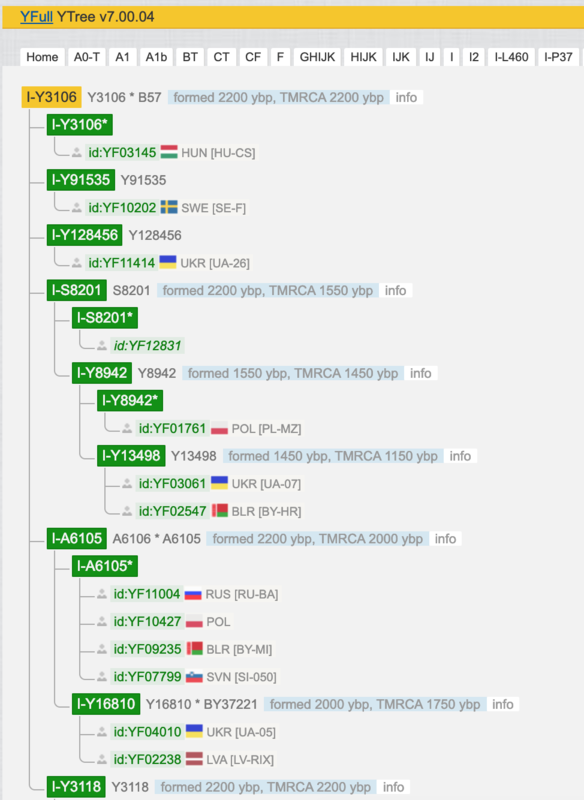 Note: I forecast (based on my guess and previous calculations technique), that ~2000 ybp, my paternal ancestor and that Lithuanian person paternal ancestor were born from one father. Who was that? What his surname? No idea at all. Besides, As I personally expect, but I’m not sure it’s correct, but YFULL put my under Y3106, which is “no call position” based on Big Y/BAM file. Same with B57. 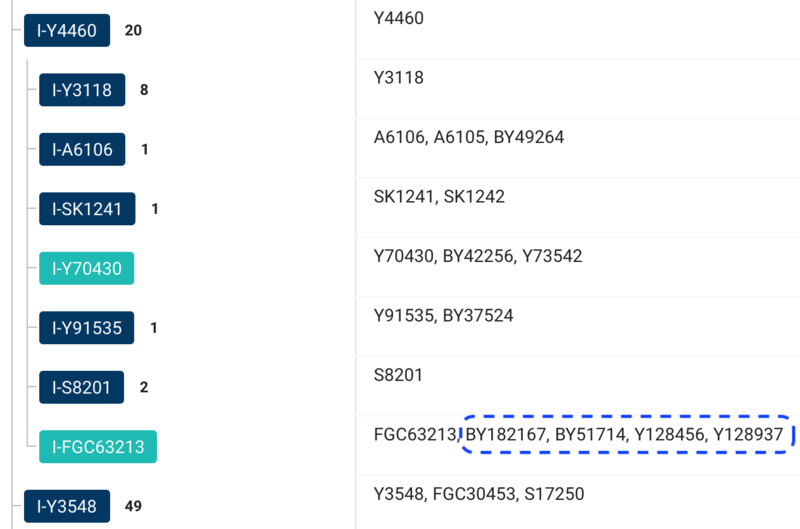 But for sure, that new positive SNPs mentioned above (represented on yfull by Y128456) are all sub branches for Y4460. 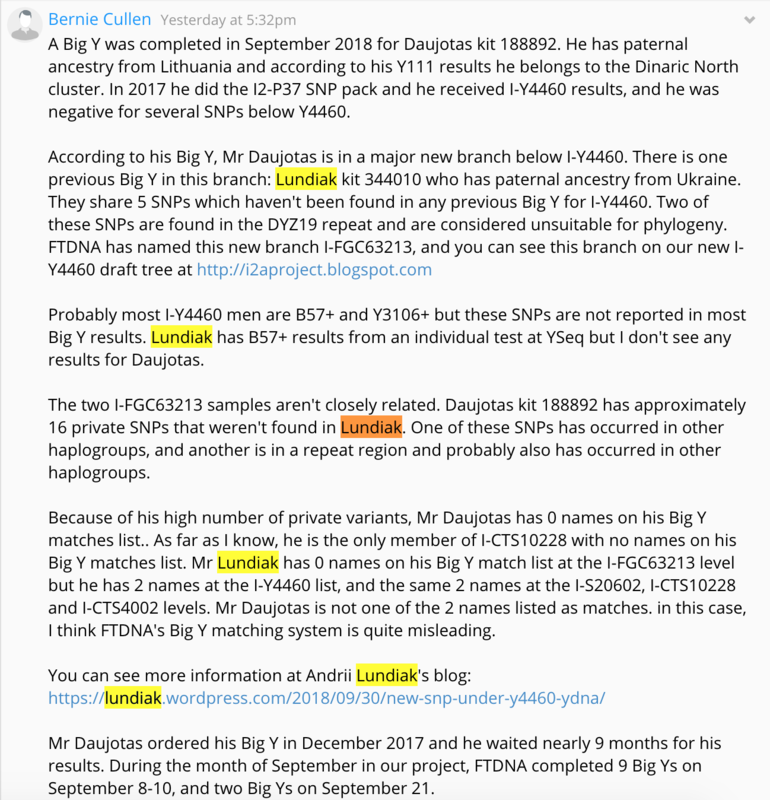 Note: FTDNA Y88617 is the same level as Y91535 in YFULL (Confirmed by Dec-2018 tree from i2aproject). BY51714 (G=>T, hg38 pos. 20278696) found but not assigned to any “qual” group/tab. New resource, discovered in Dec-2018, after Thomas Krahn mentioned it on Facebook YSEQ group. 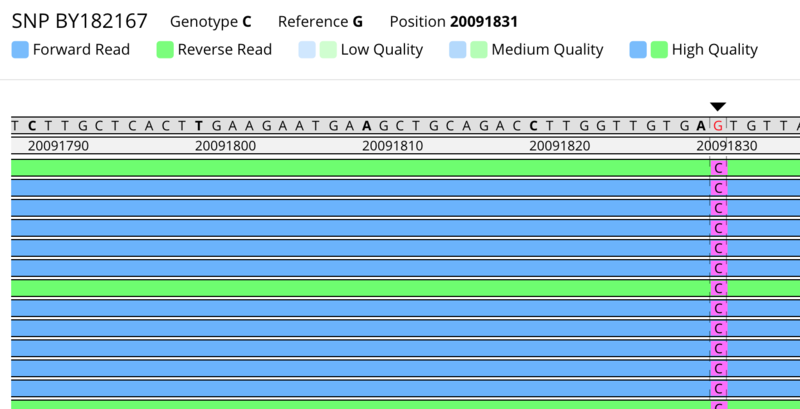 So I uploaded STRs from FTDNA and also another set, from YFULL, which in fact based on BAM file from FTDNA. so it’s quite similar, but file contents a bit different. Not really helpful for now (Dec-2018). By nature of myself and my life, I always care about true information, about proper and fair business and receiving help from others in the area where I don’t have knowledge and expertise. 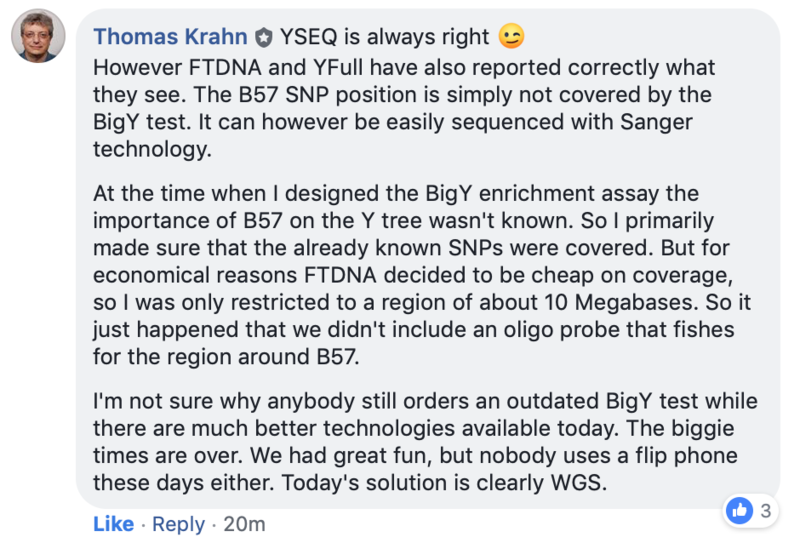 That reply by person related to #YSEQ, to my question, with explanation why YSEQ does “read” position for B57 SNP (child for Y4460) in Y chromosome, and I have T+, but neither FTDNA nor YFULL (based on BAM upload) can’t see/read. It shows me, that genetics sometimes is money for nothing, but sometimes it’s very valuable investment in future. Would be great if someone from FTDNA answer about how BigY technical base/algorithm will evolve? Will it be upgraded by using new chips (Ilumina? Sanger? ), to get latest information about genome? Does it make sense to order WGS (wiki, yseq) instead or additional to BigY? etc. The fact is, that Halych-Volhynia kindom, in particular HALYCH or Galicia, is a place, where all my ancestry from. At least since ~1750 years (AD). My latest/earlier written fact about my village is 1474 AD. These days I also research years 1200-1400, and so far no luck finding at least a fact of people living that place. To fill the gap in my research, I hope for the help from genetics, people, community, Internet. announce the introduction of Big Y-700, a substantial upgrade to our Big Y-500 product. Along with the addition of 200 STRs, we have made significant updates across the board, including the new Big Y matching tool that was introduced last week. A Big Y-700 white paper will be available with further details in a few weeks. Testers with Big Y-500 results pending will instead receive Big Y-700 results at no additional charge. These users will be emailed the expected delivery dates that are listed below in the FAQs section. This email will go out later this morning, Jan 30th, to all testers with pending results. FTDNA completed part of the Big Y-700 test for two project members. They received the Y700 upgrade, they can now see their results for STR marker Panel 7 (markers 562-838). It seems possible that I-Y4460 (I-Y3118) has been in Britain for hundreds of years. Based on genetic distances when comparing Y67 markers, the common ancestor of Powell, Lovelady, Conway and Wilson probably lived a few hundred years ago, maybe so long ago that the common ancestor likely lived in Europe, not the US. 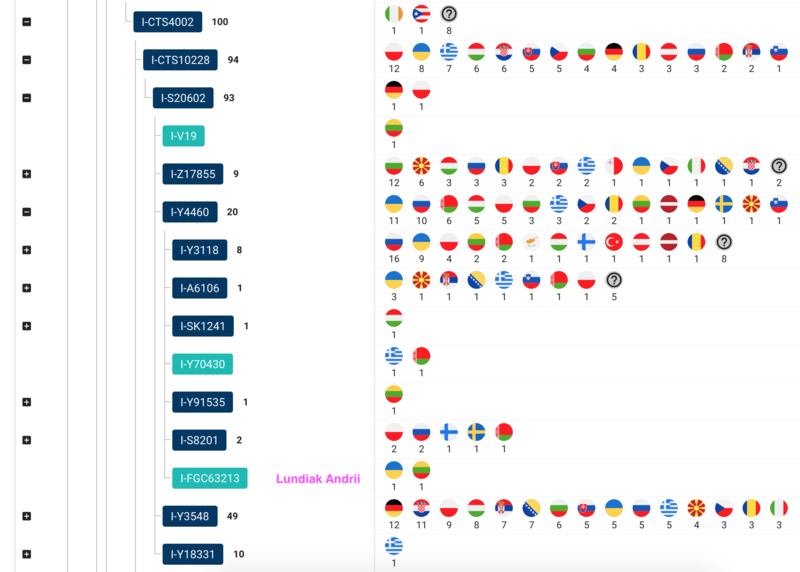 But not many members of this cluster are in this project, only one or two have tested more than Y37 markers, and they are all American and their European country of origin is uncertain.